Enjoy the Caribbean to the fullest! The Caribbean is a great place for a fun-filled holiday in a friendly company, and, of course, for a family vacation. Fresh air, charming nature of the tropics, first-class white-sand beaches, warm sun, and delicious cuisine. One can endlessly list the benefits of the Caribbean islands. Here it will be interesting for children and adults alike. Every minute spent in the Caribbean will be filled with new emotions and impressions. And you know, that is the impression that creates the best memories! Choose your dream villa! What do you need to enjoy your vacation and beautiful nature to the fullest? So, just imagine… A villa with a private pool, surrounded by greenery, that offers all the comforts of being at home. One could not ask for anything more. So, on this page you will find our Punta Cana luxury villas, located in safe and quiet areas of Punta Cana with 24/7 security. 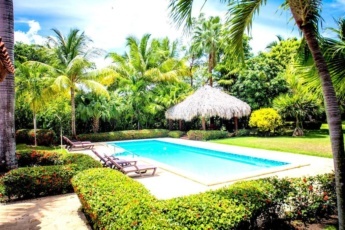 All the villas are spacious and have its private pool, barbecue area. Finally, our Punta Cana luxury villas are just 10-minute walk from the main restaurants, shops and the beach. See you soon in Punta Cana!